A Covington, Ky., Catholic diocese-contracted investigation sides with students’ accounts of a videotaped exchange with a Native American elder at the Lincoln Memorial last month that prompted people nationwide to condemn the students as racist and entitled, the Washington Post reports. 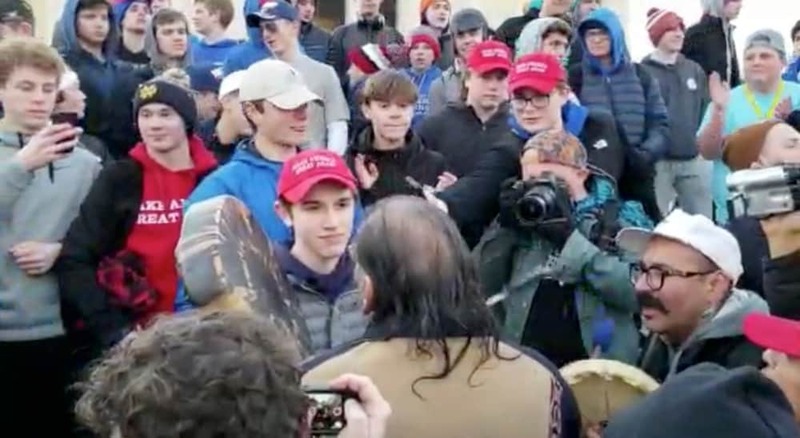 The video that went viral showed Covington Catholic High School Nick Sandmann smirking and wearing a “Make America Great Again” hat as he faced Nathan Phillips, a Native American elder from Michigan who played a traditional drum. The two appeared to be in a standoff. People who viewed the video that went viral said it appeared as if Sandmann was mocking Phillips. The Diocese of Covington and Covington Catholic High School initially admonished the boys’ actions in the video. The boys said that the encounter with Phillips was preceded by an exchange with the Black Hebrew Israelites religious sect. Investigators found no evidence that the students responded offensively to the Black Hebrew Israelites or that they chanted “build the wall,” the Post reported. The chant is generally a reference to President Trump’s push to build a wall at the Mexico border to block entry to the United States. The report also found that the students were “confused” by Phillips, who has told news organizations that he stepped into the exchange to help diffuse the situation, the Post reported. Investigators found no evidence of “racist or offensive statements” made to Phillips although some did demonstrate a “tomahawk chop,” according to the Post. The students were supported in commentary on the Diocese of Covington website by Bishop Roger Foys. “In truth, taking everything into account, our students were placed in a situation that was at once bizarre and even threatening. Their reaction to the situation was, given the circumstances, expected and one might even say laudatory,” Foys wrote. “These students had come to Washington, D.C. to support life. They marched peacefully with hundreds of thousands of others – young and old and in-between – to further the cause of life. The report was prepared by Greater Cincinnati Investigation Inc., and involved four licensed investigators who took statements from students, chaperones and witnesses and reviewed 50 hours of video. The investigators were not able to interview Sandmann or Phillips in person but did review Sandmann’s written account, according to the Post. No comment yet from Sandmann, his family or Phillips.